Relax in your own private hot tub with views of Whistler Mountain, pool and inner treed courtyard. The front porch has a BBQ and mountain views. Kick back on a comfy couch after a great day of play. We hope that you enjoy all of the comforts and amenities of this fully equipped vacation home at Glaciers Reach. Some of the recent upgrades to this two bedroom two bathroom townhome include paint, mattresses and duvets. 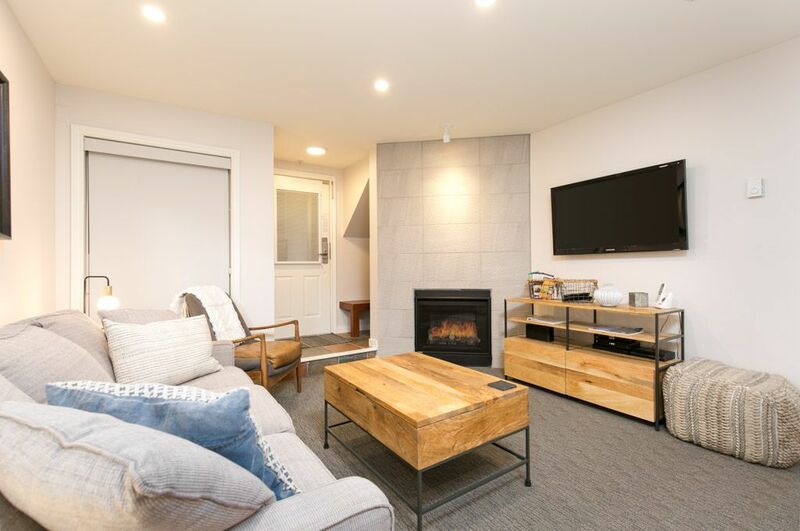 Other features include a BBQ, X-box game system, 2 LCD TVs, stereo, gas fire place, heated year round pool, shared sauna, free underground parking and high speed internet with Wi-Fi. This vacation home sleeps a maximum of six guests but four is recommended. The bedding consists of a queen bed, two twins that can be joined to make a king upon request and a queen sofa bed. All of our Whistler vacation rentals are professionally managed, well maintained and exceptionally clean. Absolutely loved this property. Clean, newly renovated, beautifully decorated and convenient location. Would 100% stay again and recommend. Accommodations were very good for family with children. This is a great unit to stay in! We love there are actual beds for our two older sons rather than sofa beds and plenty of room to spread out. We love the jetted bathtub plus the hot tub. We love it&#x2019;s a bottom floor unit and a very short walk across the street to the free bus that drops you at the bottom of the mountains. It&#x2019;s a perfectly clean on arrival, updated condo and the owner is very responsive. The townhouse is just a few minutes walk from the Village and IGA, making grocery shopping very convenient. The house is very clean and well maintained. It it well stocked with towels, dishes, detergent and even coffee filters. The space is perfect for 4. 6 is a little tight; you will want to put away the sofa bed during the day for seating space. Trevor is a good host and he responded to my emails within an hour or so. Not sure if this is a one off of another guest stay, but every morning the dog upstairs would bark from 7a-roughly 8am non stop and would wake everyone up. Other than the dog barking, it was a great place and I would love to go back. Highly Recommend - Great condo. Nicely and comfortably updated. Very quiet at night - so you will get a full nights sleep, which cannot be guaranteed if in the village where there tends to be a lot of noise after the clubs close down. Easy access to village and private hottub was a big hit after a day on the mountain. Trevor was super easy to communicate with and made sure all our needs were met.